The Solar Impulse plane has set a new distance record for solar-powered flight on the second leg of its trans-American journey on Wednesday evening. 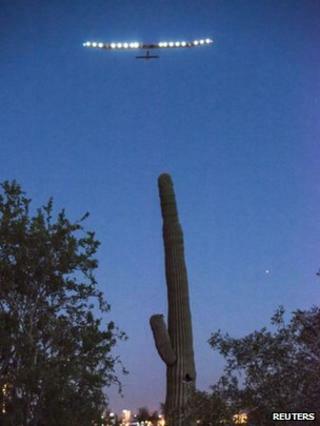 The craft landed in Dallas, Texas, after an 18-hour flight from Phoenix, Arizona - a journey of 1,541km (958mi). In the coming weeks, it will also stop over in St Louis, Missouri, and Washington DC before heading to New York in early July. The project aims to showcase the capabilities of renewable energy. The Solar Impulse HB-SIA has the same wingspan as an Airbus A340 but at a weight of just 1.6 tonnes - by comparison, a fully laden A340 weighs about 370 tonnes. The plane's wing and stabiliser are covered with nearly 12,000 solar cells, which drive its four propellers and charge the plane's 400kg of lithium-ion batteries for night-time flying. The Across America bid is billed as the first cross-continental flight by a solar-powered craft capable of flying in hours of daylight and darkness. It is the last showpiece with the prototype aircraft before the Solar Impulse co-founders and pilots, Bertrand Piccard and Andre Borschberg, attempt an around-the-world flight in 2015. The craft already holds records including the first inter-continental flight in 2012. The two Swiss pilots will alternate on different legs of the journey; Wednesday's flight was piloted by Andre Borschberg. Mr Borschberg also holds a record set in 2010 - the longest-lasting flight of a solar-powered craft, at more than 26 hours. "This leg was particularly challenging because of fairly strong winds at the landing. It also was the longest flight - in terms of distance - ever flown by a solar airplane," Mr Borschberg said. "You have to understand that the pilot needs to stay awake for more than 20 hours without any autopilot." The plane completed the first leg of its trans-American bid - between San Francisco and Phoenix - in early May, in a flight lasting 18 hours. The Across America project coincides with the pair's Clean Generation Initiative, an effort to encourage policy-makers and businesses to develop and adopt sustainable energy technologies.